This page is dedicated to the frequently asked questions about St Mark James first aid and CPR courses. I have lost my certificate, how do I get a new one? Candidates that have lost certificates are recommended to contact the provider of the course (example: St Mark James or Vancouver First Aid) to be re-issued certificate. Training partners can not re-issue lost certificates. Are the multiple choice tests difficult to pass? 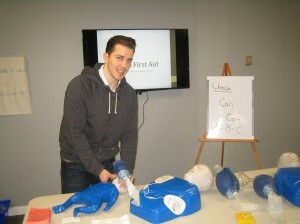 No, most candidates that take St Mark James first aid and CPR courses have no difficulty completing the course. Over 95% of candidates successfully complete the course. The multiple choice test consists of about 50 questions and candidates need a minimum grade of 75% to complete the course. What is the difference between Emergency and Standard first aid? Emergency first aid is a 8 hour course in which candidates learn basic CPR (but can opt for a higher level of CPR) and basic first aid. Candidates will cover a minimal amount of first aid topics in a emergency first aid course when compared to standard first aid. Standard first aid is a 16 hour course that covers all of the topics from emergency first aid plus a additional number of first aid items. CPR level “C” comes standard with standard first aid and CPR level “A” comes standard with emergency first aid. Both courses have available re-certification classes. Its been more than 3 years since my last course. Can I still take a re-certification class? No, St Mark James does not allow for candidates to attend re-certification courses after 3 years of not taking either a full course or a re-cert course. After 3 years candidates are required to re-take the original course. I have a good first aid and CPR background, can the course be any shorter than the advertised length? No, unfortunately the course is required to be set for a certain length based on provincial regulation. Instructors are required to teach the minimum length of time. How often do the standards for first aid and CPR change? The International Liaison Committee on Resuscitation (ILCOR), which is the leading body on CPR research in North America, recommends changes to first aid and CPR techniques and knowledge requirements approximately every 5 years. The last change was implemented in 2011.